Hey y'all and happy Wednesday! Today I'm so so excited to share some renovation #3 updates with y'all. 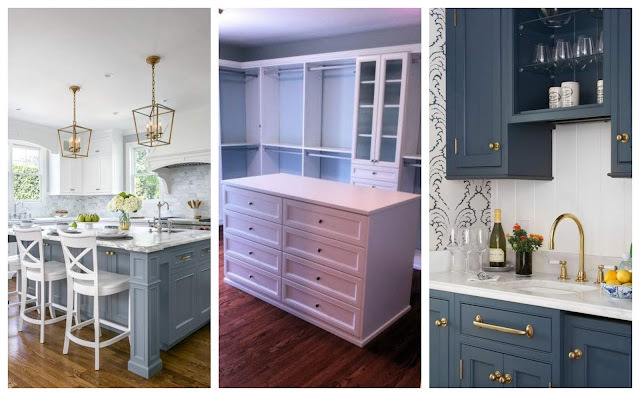 I'm talking all things paint, tile and custom cabinets! I finally picked out all of the colors for the house (can the light fixtures come that easily please?) and we've also picked out all of the tile. 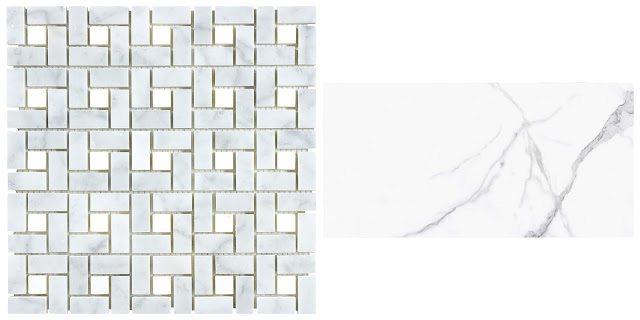 I was shocked with how quickly we agreed on all of the tile options. I mean, we went in, spent about an hour going over ideas and piecing together samples and literally walked away with everything (that was in stock currently) with a 20% discount through the end of this month. SCORE! 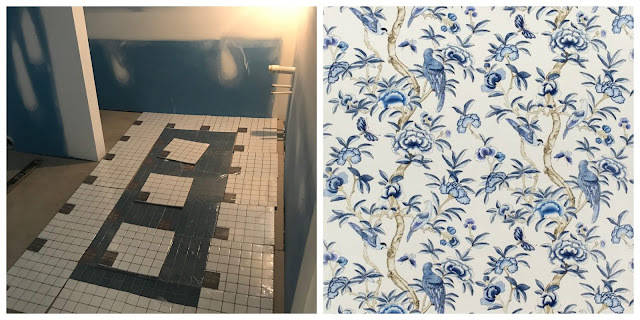 We decided to do tile in the half bath/laundry room, Andi's bathroom and master bathroom. The guest bath, wet bar and kitchen will remain hard wood. For Andi's bath we went with a ceramic honeycomb look in white. It looks great with her wall color and with a white grout it will look crisp and clean. You can get the look here. 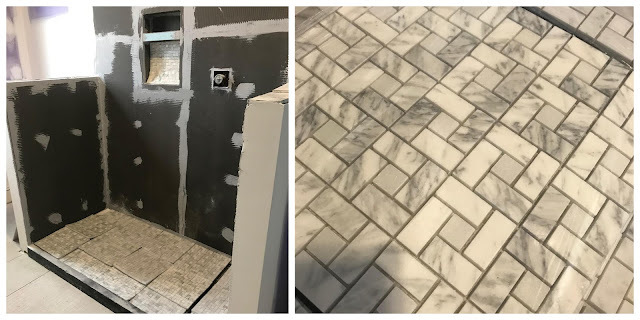 In the master bathroom we went with a porcelain marble tile for the shower walls and bathroom floor in a larger size and then a smaller marble mosaic tile for the shower floor and wall insert. I'm so over the moon about these picks and I cannot wait to see them finished! 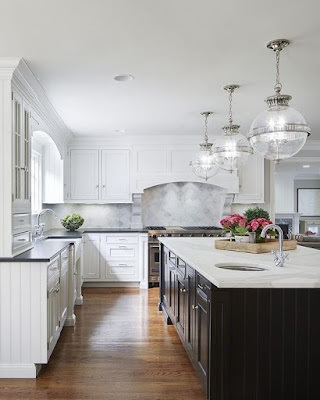 The veining will really tie in with the gray vanity and pale gray paint on the walls. I'm also excited to see the sconces and mirrors once they've been put in. The half bath and laundry room is where the fun starts! 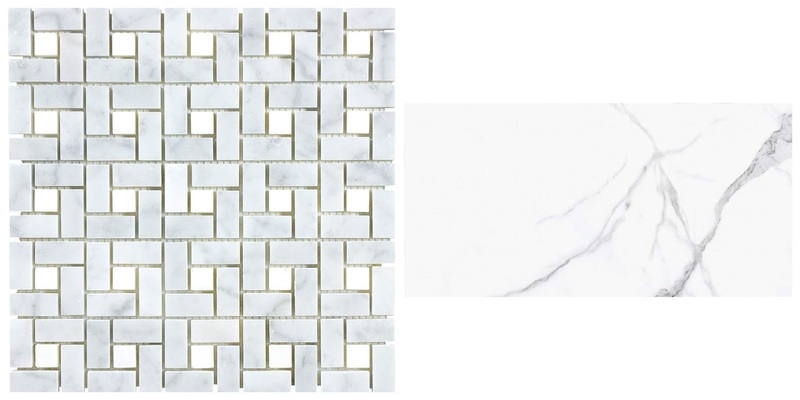 We decided to go a little off the grid and design a neat tile inset just to add some flare to the space. This is the room where I will be putting up wallpaper that consists of mostly blue, white and gold hues. The wallpaper will be on a half wall so the floor and design will be divided by a chair rail-esq panel. We decided to use small ceramic white square tiles with matching blue ones to create a fun design. This is what we have been playing with design wise so far and I've paired it next to the wallpaper I'll most likely be ordering for a quick visual. Add in our cute pedestal sink, mirror and lighting and you have a not so average laundry and half bath space! Lastly on the renovation home front, we met with the custom cabinetry guy one last time yesterday to finalize the kitchen measurements now that the drywall is complete. Can I just say one thing here? I AM SO EXCITED ABOUT OUR FUTURE KITCHEN! We have a large island that will house the farmhouse sink, dishwasher, trash pull-out and 6 drawers. The back side will have an overhang for up to 4 bar stools. On one wall we will have display cabinets, lowers and a neat 'jut-out' in the middle to add some dimension under a window. On the other wall will be neat storage cabinets, stove, microwave, fridge and closed uppers. We'll be using original glass from the home's old windows as well for the displays. We'll have a custom wet bar going in and I decided to add a tall/skinny pantry type cabinet in there for more food storage. He also agreed to build our island for the master closet! Ek! Timeline is around 6 weeks (once we get the flooring in) so let the countdown begin y'all! Stay tuned & thanks for linking up today! 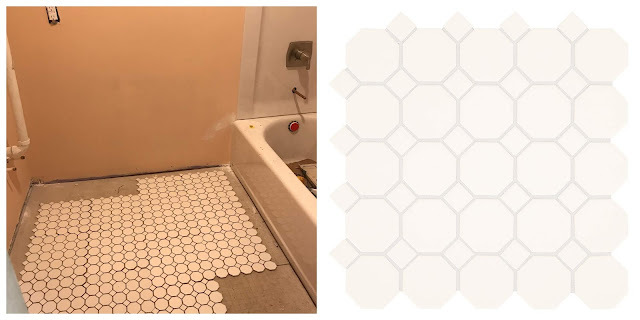 I love that honeycomb tile! That's what I'm wanting to do in the boys' bathroom when we (finally) redo it, so please let me know how you like it! Love it all. Seriously its going to be beautiful. GIrl, loving all of this. Some of the same colors and patterns we have in our house :)! I love your paint colors and that wallpaper! I cannot wait to see the finished product! Especially the kitchen! OMG that bathroom tile! And I've been thinking of painting our whole downstairs Repose Gray!! Let me know how you like it! It all looks so good! I want to repaint all of our common areas something similar to Repose Gray - or some sort of greige! I have the hardest time thinking about choosing colors for the whole house - so I love how well you've picked colors that all flow together! I live everything! Can’t wait to see it all together!! So exciting! I used naval in Dillon's room and our entire house is painted revere pewter which is really similar to the repose I think. Cannot wait to see this come together. 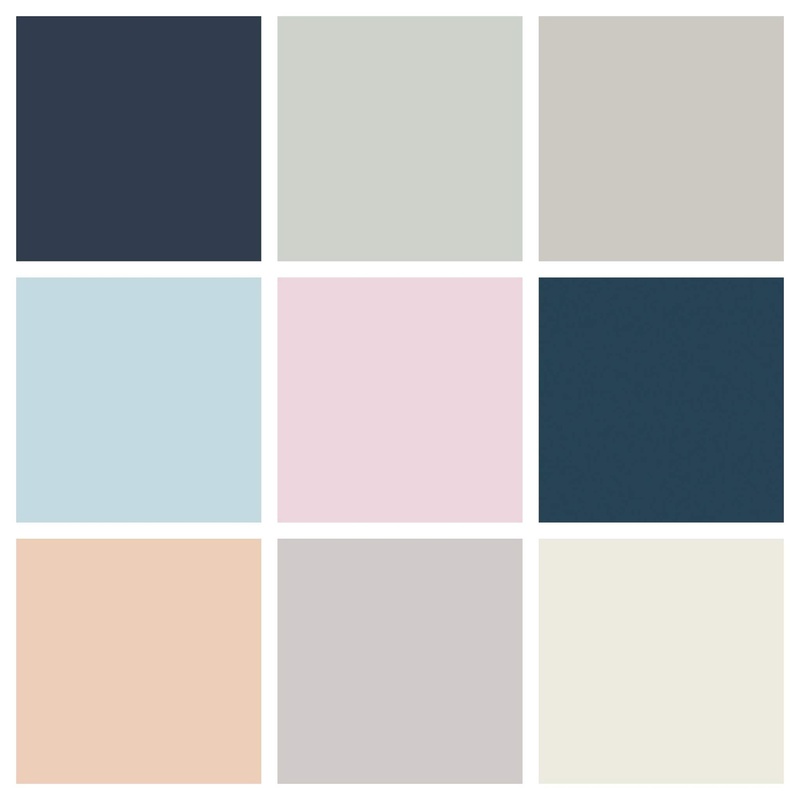 I am loving all of your paint color inspiration, our home is decorated in a very similar color pallet! I can't wait to see everything once it's finished, thanks for sharing! Love your choices! Seriously you guys knock it out of the park with reno! You're so brave to do blue ceilings! Did you do that before or is that a new option you're experimenting? !